The use of pottery in East Norwegian graves dating from the late Iron Age has been the subject of research work conducted by Christian L. Rødsrud at the Museum of Cultural History in Oslo. "I wanted to look at complete vessels, not shards, and view their use in connection with people's mythical conceptions and the broader developments in society," he says. The period that Rødsrud studies extends from 500 BC to 575 AD. "Over this long time span, I have discovered a surprisingly clear divide. Early in the period, the vessels are largely used as cremation urns. But from the beginning of the Roman Period (1 AD) complete sets of vessels for food and drink were also buried in the graves with the deceased. It is reminiscent of a table setting, almost as you would see in ritualised feasting." "In the cremation urn, the deceased is consumed by fire, which is a passive death. But through what appears to be a table setting, ties are created to a life that has been lived. The deceased is no longer consumed, but is himself now participating in a banquet," explains Rødsrud. Eventually the coarse clay vessels, used as cremation urns, almost disappear from the graves, and the finer, decorated tableware or goblets start to predominate. "The new focus on food and drink in the graves symbolises an idealised lifestyle," says Rødsrud. In the culture of ritualised feasting, the hall holds a central position, and there is usually a military commander there with his entourage and other guests. Strong charismatic leaders emerge in this culture. Leaders who undertake expeditions and plunder, and that make important decisions in the halls. It is through these drinking banquets that the military commander forms close ties to his people. "We first find these complete sets of vessels in the finest graves, eventually also accompanied by Roman glass and bronze objects. As time progresses the vessels show more individualised characteristics. This accords with a general change in society, where more focus is placed on the individual." Imports have also played an important part in the change, Rødsrud says. A confluence of Roman and Germanic influences gives rise to the new vessels. The new custom initially appears in the area of Østfold, but rapidly spreads to Vestfold. And with the transition to the age of migration, Vestfold and Telemark take over. The old tradition with urns does not entirely disappear during this period, but the vessels are given new meaning through the sets. "My interpretation is that these vessels are materialised symbols of ideology and power structure in society. They can highlight social differences, among other things." When the elite are no longer able to differentiate themselves through the use of increasingly finer vessels, the use of ceramic grave goods grinds to a halt. "It's similar to what we see today. The rich find ways of standing apart. But once their practice is absorbed into the mainstream, they must find something new." Rødsrud views the development of ceramic vessels in connection with people's mythical and ritual conceptions. In both Celtic and Norse mythology the vessel is connected to sacrificial meals, ritualised feasting and death. Probably as a symbol of regeneration and rebirth. "In the mythology, drinking vessels are associated with the life-giving properties of drink, and with power. The culture of ritualised feasting, which has probably been a part of the social life of the elite throughout the Iron Age, emphasises the same," he says. By analysing remnants and trace elements in the vessels, it has been possible to conclude that they used to contain food and drink. It is the first time that trace elements in clay vessels have been analysed in Norway. But similar analyses have been done in other countries, where they have found traces of fairly potent mixtures of grains, herbs, honey and berries. "After analysing trace elements in thirteen vessels from graves in the Oslo fjord area, we have an indication that the tableware has been used for mead or beer," says Rødsrud. 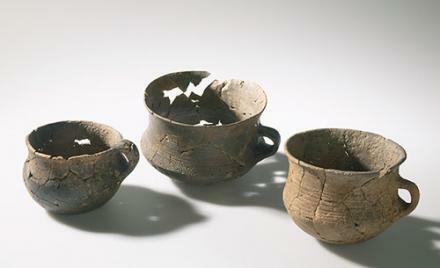 The coarser vessels contain remnants which provide evidence that they used to contain food. The smaller and more elegant vessels with smooth, polished exteriors and decorations contain trace elements from carbohydrates, such as glucose and sugar. "These could be the remnants of drinks based upon malt, berries or honey," says Rødsrud.